Eastasia Routed at B-R5RB! 70+ Titans Down! What to say about the fight at B-R5RB? It was a battle to eclipse Asakai, the capital ship engagement that took place exactly one year before. 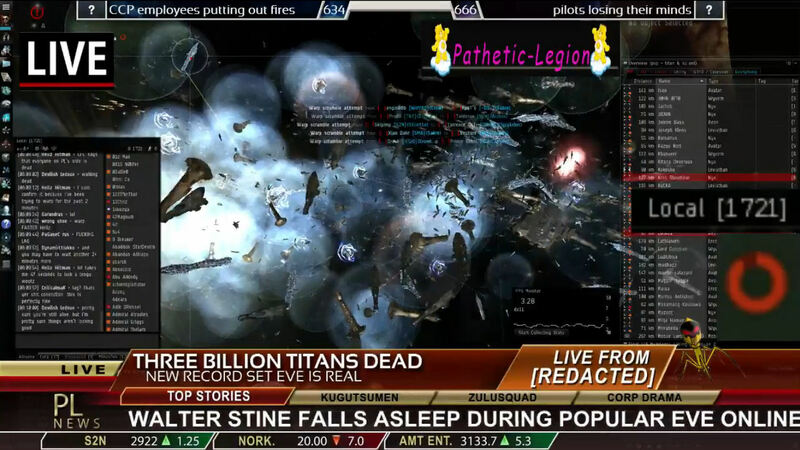 It was one of those events that demonstrates the scale of the possible in EVE Online in terms of players involved and resources consumed as well as the time frames required. The first notification that a fight might be going down was broadcast about 8am PST yesterday when it was reported over at The Mittani that sovereignty dropped on the system B-R5RB after down time. Nulli Secunda forgot to pay their recurring sovereignty bill (you get a reminder and it pretty much adds up to pressing a button) and so they lost the system. They set about restoring their sovereignty while Russian and CFC units started poking around to investigate what was going on in what Pandemic Legion and other N3 forces had been using as a staging system for operations in the war in the south east. If what I heard on coms last night was correct, Lazrus Telraven took the command decision for the CFC to go “all in” on contesting the system. The fight was on. I’m going all in. Get here. I was at work, done with my morning tea and busy poking away at test application. These things always seem to start on Euro time while I am at the office. I checked Twitter throughout the day as EVE-Kill, which tweets every expensive ship loss, and ever super capital makes that grade, called out the losses one by one. If you want to know when something big is going down in New Eden, that is a Twitter account to follow. Titan kills kept getting reported all day long as capital fleets piled into the system. Several live streams were up. When I finally got home, I checked into the Pandemic Legion stream to see what they were saying. They were reporting 20 Russian/CFC titans down for 38 N3 titan losses with less than 2,000 people in system. There was a call for a Dominix fleet about then, so I logged in and joined up. However, we were left hanging in a POS for quite a while before being dismissed. There was nobody available to bridge us anywhere, all the titans online were engaged in the fight. I logged back off and went and had dinner with the family, then watched the Sherlock that got recorded Sunday night. The wedding episode. Fun stuff. After that and a bit of cleaning up I headed back to my computer. 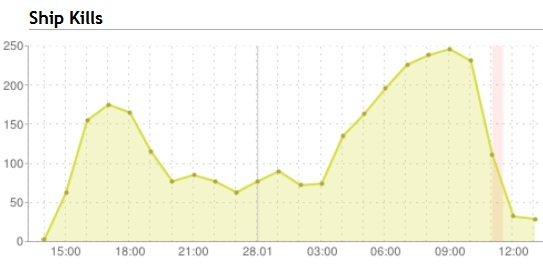 By this point the Pandemic Legion stream had stopped counting losses. When I shoved off earlier it sounded like the fight might be winding down. There was loose talk about extracting our forces, some of whom had been on for nearly 12 hours at that point. There was also a call for reinforcements for the Dominix fleet I had left earlier. A titan had been found to move us around and the fleet had been sent out eventually. I got back into my Domi and out with some other reinforcements (eluding the Dirt Nap Squad camp in our own staging system) only to be sent off to a system a few jumps from the main fight in order to shoot structures. Joy. A structure shoot during the biggest event in a long time. We were there to try and draw off some of the capital ships that were assisting N3 in the big fight. This had apparently worked a couple of times previously. Carriers had been dropped on Domis, or so I was told. But by the time I was out with the fleet N3 had lost interest in what we were doing. Eventually Reagalan, our FC, decided that the venture was fruitless and arranged a bridge back to G-0 for us. The fleet was standing down. But that was only for a short break. A new fleet went up on Lyris. The Mittani himself got on coms to tell us we would be bridging into the fight in B-R5RB. We were to refit out Domis to have four energy neutralizers in our high slots and get on the titan. Our job was to drain the capacitors of hostile titans so that their repair modules would cease to function, making them easier to kill. We were not to launch drones. Nobody wanted to crash the system at this point… nobody on our side anyway… while there were still at least a dozen titans on the field to kill. After a short wait, the bridge went up. And then there was a much longer wait in the warp tunnel to B-R5RB. Reports were that the system was responding much better than it had been earlier in the day. Modules were responding to commands within a few seconds and things were generally working. But time dilation was still at 10% and updates in the UI were sketchy at best. So riding the bridge into system took quite a while. I spent 15 minutes in limbo, from the point I selected the “jump through” option to when I was actually up and systems systems functioning in B-R5RB. Somewhere along the way the system lost track of me and warped me off to a safe spot, so that when I finally loaded I had to endure what I would call a Zeno’s Paradox warp, where the distance to the final destination kept dropping in half, but never seemed to want to finish. I think I was down to 122 meters until warp bubble collapse before the system finally decided I was there. And then I was on grid amongst the battle of titans. The field was a mass of warp disruption bubbles and giant ships. There were titans strewn about, as the N3 ships were trying to move out of the bubbles to escape. But each was pinned down. Meanwhile, hundreds of super carriers, carriers, and dreadnoughts hung about the field, secondary targets when compared to the big fish. My screen shots are in a gallery after the cut at the end of this post, but they do not do the fight justice. It was like no other fight I have been in. But it was time to get to business. We moved to the first titan on our list, bushy2, and began to neut him down. Things went slowly. We drained him and then watched the capital ships burn him down. We moved on to Chris baileyy. My capacitor and velocity read-outs in the UI stopped functioning. We applied neuts as the next target was called, Mandrake Seriya. Then it was Ryan Coolness, then Needa3, and then Maggy Lycander. Doomsdays flared from our titans, burning down the drained targets as dreadnoughts and super carriers kept up a constant stream of fire. In all, from the time I dropped into system to the point of the 6th kill more than two and a half hours had gone by. It was now midnight my time and 16 hours had passed since the fight started to develop. It was well past my weeknight bed time. But what to do? There was no way I was getting back to G-0 at that point, and I wasn’t keen to stay up until at least downtime, three hours hence. So I just left myself logged in and following the fleet, turned off the monitor and hit the sack. What the hell, I got on some titan kills. When I checked in the morning, I had been logged out for downtime, but there was no kill mail for me, so I appeared to have survived. My Domi is sitting in B-R5RB waiting for me to log in again. But there are lots of ships in that state. Our forces managed to kill the final N3 titan about 90 minutes after I went to bed and then started in on the super carriers until downtime. And, in looking at the coalition broadcasts, there will be camping and mop-up operations going on for some time to try and catch N3 capital ships as they log back in to try and escape. You can see the ebb and flow of the fight in the report from DOTLAN. There was the initial rush, the mid-period when the system was at its slowest, then as things started to thin and the Russian/CFC forces started to get the upper hand, the kills increased until downtime, which is the red bar. And then kills resumed. Or kills tried to resume. Today is also the Rubicon 1.1 patch, which appears to have broken any number of things. 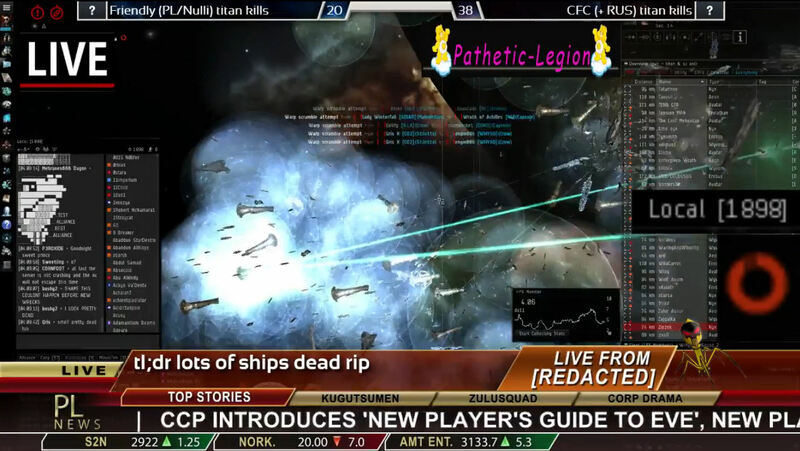 There are reports of friendly stations shooting people and CONCORD issues and all sorts of fun things… because CCP. We shall see which side all of that favors, if any. And what does all this mean? This wasn’t the biggest fight in terms of people involved or total ships killed, I think 6VDT-H still wins there, but it surely must be the most expensive fight in the history of the game. CCP put up a coy tweet about the total titan losses. That is 75 titans down in one day, each one of which cost at least 100 billion ISK. Some of them were more than double that, when fit with officer modules. I think, over the last seven years, I might have had a total of maybe 10-12 billion ISK all combined, so for me that is a staggering amount of destruction. Call it at least a 7.5 trillion ISK day as an opening estimate. I am sure CCP will roll out the stats as soon as they can. In the mean time, they are in there with an offer to help rebuild! Expect prices in Jita to go up on speculation alone. Massively remains oddly absent from the list of sites covering this. 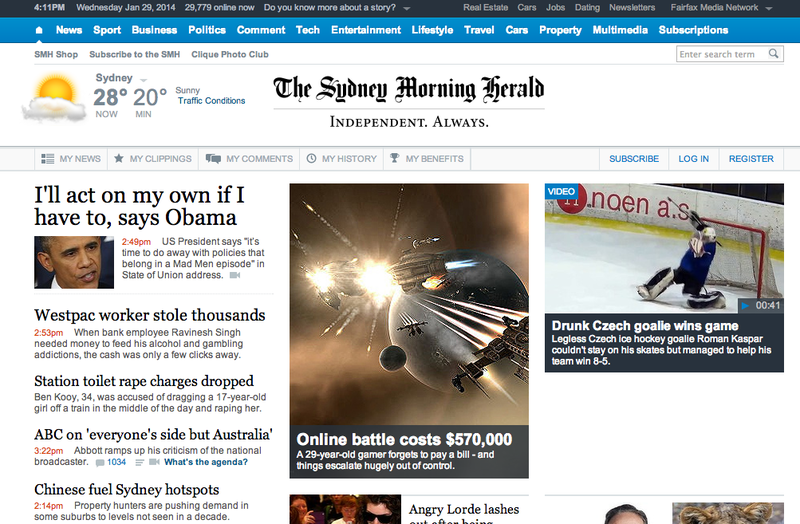 If I got all my news from them, I’d think it was just another ho-hum week in space. Even my local paper is ahead of them. As for what it means to the three big null sec coalitions… I don’t know. I imagine that NC and Pandemic Legion have enough reserves that this won’t hurt them too badly in the long term. They will rebuild. In the shorter term, their ability to project power and drop supers onto fights has been diminished. We will see how that plays out. And for me, well, I am on six titan kill mails and I saw another giant battle. Good enough for me! Screen shot gallery after the cut. This entry was posted in entertainment, EVE Online, Null Sec and tagged B-R5RB, Curse, I Was There, Lazarus Telraven on January 28, 2014 by Wilhelm Arcturus. New banner is jaw-dropping, as are the other screenshots. I ran down there in an interceptor and got on 6 titan kills as a third party. One hell of a spectacle. Yeah about $238,000 if you were converting at current PLEX market rates. Mostly a meaningless figure though as almost no one would spend real world money to buy a Titan or any other super expensive ship in EVE. I really wish there was a way to bottle up the essence and excitement of these type of stories and feed it to new players. It would really give a big boost to new targ .. err players. @Zaphon6502 – This is indeed why people endure sitting on a titan for hours or going on structure shoots. Every once in a while you get to do something special. The question here will be how much this battle changes the war. N3 has been running carrier fleets backed up by a supercap hotdrop threat. If that threat is gone, or has been drastically reduced, then their carrier doctrine will have to change, leading to a ripple through how the war is being fought. I love playing EVE this way. Well done, again, TAGN. @Zaphon6502 – Nice! That headline abstracts the cost idea even further. But now I want to know what Lorde was lashing out about. but what I miss in all the reports, including this one, is: who onlined the TCU in B-R5RB? I mean, sure it’s fun to kill stuff, but if CFC/RUS didn’t get control of of the system it’s a pretty Pyrrhic victory; and if N3PL lost control, it’s catastrophic. So umm, who owns the system now? @seanas – I linked to DOTLAN, but I guess I didn’t say it outright, RAZOR grabbed the sov. I got back in to game last night and was able to dock up in the station.